The 5 Best Canon Lenses For Video Available Today! Aside from their superb performance as image capture devices, DSLRs are also great for taking videos. In fact, lots of DSLR cameras these days are designed to function as premium video capture devices as well, allowing users to get extra functionality out of their camera aside from just snapping photos. Another reason why DSLRs are great investments for videographers is the fact that you can buy accessories and attachments that can either add another function to your device or improve its performance all together. For instance, lenses are a great way to switch up the way your DSLR takes videos and may even get it to work like a full-fledged professional video camera. Check out our list of the best canon lenses for video and step up your videography game with these tried, tested, and trusted picks. Based on consumer reviews and feedback, the Canon EF 50mm/f1.8 STM lens takes the cake as the best Canon lens for video. This premium camera accessory has a 50mm focal length and a maximum aperture of f/1.8. These specifications allow the lens to step up your camera’s image output quality effortlessly. It’s specially designed for superior quality portraits, action images, and night time photography, but it also does well for everyday photography and landscapes. What makes it particularly ideal for videography is its near silent autofocus function. Able to continuously adjust its focus on moving subjects, this lens can give you crisp, clear, and noise free video recordings as you and your subject continue to move around the field of view. Finally, the Canon EF 50mm f/1.8 STM Lens is a great choice because of its affordable price. Lots of lenses cost upwards of a thousand dollars, but at just a little over a hundred, this lens is definitely a steal. So if you’re looking for and excellent choice of lens and you’re trying to work on a stiff budget, be sure to check out this option first and foremost. Much more affordable compared to a lot of the other Canon lenses on the market. Silent autofocus mechanism doesn’t compromise recorded audio from video captures. Easy to install and use. Produces professional grade photos and videos effortlessly. Build quality isn’t the best, but it’s not the worst either. The Canon EF-S 55-250mm f/4-5.6 STM Telephoto Zoom Lens is a premium lens that gives a narrow image and superior zoom. The focal length makes it perfect for creating telephoto images, including portraits and action shots that are perfectly framed by the lens’s narrow view. In terms of image quality, the EF-S 55-250mm f/4-5.6 IS STM Lens delivers. This premium piece of imaging equipment uses an ultra-low dispersion element that reduces chromatic aberration to give you perfect coloration and minimal distortion. It also features built-in optical image stabilization that prevents noise caused by shaky hands and movement. Finally, the Canon STM technology promises ultra silent operation as the lens is in use. This means you can zoom in, out, and capture videos without any noise interrupting the quality of the audio of your video. In many ways, this can be a great advantage especially if you’re tired of editing out the whirring noises that lenses make as they adjust while you take videos. Superb image quality with optical image stabilization, ultra low dispersion element, and enhanced lens coating. Each image comes out with superior color and contrast. STM technology produces minimal to no sound during operation so you can capture noise-free videos. Unique zoom and image view make for a different image and video capture style. Ideal for shooting in dim lighting with uniquely design lens optics. Able to achieve greater zoom than many other lenses on the market. One of the more affordable options on the list. Large, bulky, and heavy, making it difficult to carry around. Telephoto quality may make it restrictive for certain users in terms of style. Maximum zoom isn’t the clearest. If you’ve got a little more to spare and you don’t mind splurging on a camera lens, then the Canon EF-S 10-22mm f/3.5-4.5 USM SLR Lens might be just right for you. As the most expensive option on the list, it does intimidate some buyers with its price tag. But ultimately, it does offer a bunch of features and functions that can justify the hefty price that goes with it. This wide angle lens is the perfect accessory if you want something you can use for landscapes and scenery. It also features both auto and manual focus, that you can easily make use of to help target your subjects with ease. A unique close focusing feature reaches up to 9.5 inches, filling your entire screen and view with your chosen target as small as 3.6×5.4 inches. Its circular aperture design creates natural highlights throughout images and videos, giving an extra dimension of depth and style perfect for professional photography or videography. It also features a strong, sturdy, robust built that’s guaranteed to last many years of use without showing the slightest signs of wear and tear. Superior image and video output with crisp color and detail, as well as minimal to no distortion, noise, and aberration. Durable and robust build, promises to stay problem-free for years even after daily, frequent use. Superior autofocus functionality makes it easy to capture crisp, smooth images and video even with movement. The most expensive option on the list – costs up to 6 times the value of other, cheaper lenses on the market. Autofocus isn’t silent, so it may cause some noise during video recording. If you’re looking for a wide lens but you’re not willing to spend the steep amount for the previous option, this one’s the right choice for you. The Canon EF-S 10-18mm f/4.5-5.6 IS STM Lens is the ultimate ultra wide lens, giving you a unique perspective on landscapes and sceneries. The optics on the lens provide superior depth and contrast, giving extra dramatic effect to photographs for effortlessly professional outcomes every time. While it isn’t top of the line, the Canon EF-S 10-18mm f/4.5-5.6 IS STM Lens is a fun lens perfect for amateurs and beginners who want to experiment with different photography styles. It also offers superior video capture quality and a silent AF feature that helps prevent noise during video recording. When it comes to price, the Canon EF-S 10-18mm f/4.5-5.6 IS STM Lens definitely isn’t the cheapest. But with all its great features and functions, the lens does pack quite enough to give you the best value for your money especially if you want to get your hands on one of the best camera lenses available on the market today! Compact, lightweight, and small, easy to carry around with you on the field or the set. Feature rich, offering superior ease and simplicity perfect for beginners and amateurs. High end optics promises high quality images even in low light settings. Get professional quality pictures and videos effortlessly with each use. Ultra wide angle lens is particularly ideal for landscapes, sceneries, and other outdoor settings. Some images can come out too bright depending on ISO settings. It may be necessary to make manual adjustments to prevent burnt images and video. The last on our list of Canon lenses is the Canon EF 50mm f/1.4 USM Standard Lens. 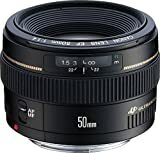 What makes it one of the best choices is the fact that it features a 50mm focal length that makes it the perfect sidekick for everyday shooting. Enjoy high quality images and effortlessly professional outcomes every time when using this versatile lens that can perform seamlessly in a variety of different settings. What makes it a great choice is the fact that it packs a USM motor which operates fast, easy, and virtually silent so you can record videos minus the whirring noise of adjusting internal optics. Plus, it also has high-refraction lens optics that help correct lighting and color to prevent sudden capture changes that commonly occur during video recording. Fast, silent, and effective, the Canon EF 50mm f/1.4 USM Standard Lens is definitely a top contender in the market. With its superior functionality and superb output quality, the opportunities are close to endless with this undeniable camera lens investment. High quality output with each use. Crisp color and detail, perfect for a variety of settings and uses. Highly versatile, able to produce professional level outcomes in a variety of settings. Ultra silent AF function makes it ideal for capturing video minus the noise of adjusting lenses. Double the price of a lot of other lenses that may offer the same functionality or more for a lower cost. How to Choose the perfect lens for your needs! Not all lenses were made equal. That said, you may have to check your options before diving into a purchase to make sure you’ve got the best value for your money. Lots of different Canon lenses have received feedback as great video lenses, but ultimately, the right choice depends on how your chosen lens suits your needs and preferences. Consider these factors when making a purchase to get the best value for your money. Type of Lens – The first thing you may want to consider is the type of lens you’re getting. There are lots of different varieties that offer a number of different photography styles that can either expand your skills or limit them all together. Some examples of lens types would be macro, wide-angle, and portrait lenses, but there are many others that can function as more than one type of lens. These can give you more room to explore, but may also perform at a lower capacity than dedicated lenses. Specifications – The specs of a lens ultimately pertains to its aperture and focal length. Ultimately, these two measures tell you the depth of the images, the amount of bokeh they can create in the background, and the amount of light they allow in vary greatly, and depending on the photography style you want to achieve, it may be necessary to explore the outcomes of different measurements before you make a purchase. Cost – You’ll find that the prices for these lenses can actually span a wide spectrum that can be budget friendly or completely impractical. In fact, some lenses can retail for several thousand dollars, depending on its features and performance. Before you set out to buy anything, make sure to set a budget and find out how much you’d be willing to spend. This way, you can weed out options that either fall short of your budget or exceed it. It’s great fun shopping for lenses for your camera, but be sure to stay in the know when you make that consumer decision. Check out our top 5 picks for the best lenses available for video and discover why these premium choices have made it to the top of countless user reviews throughout the web.